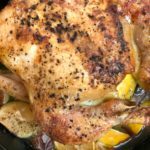 Perfect may seem a bit over blown when it comes to describing this chicken recipe, but honestly, it’s the right word for it! 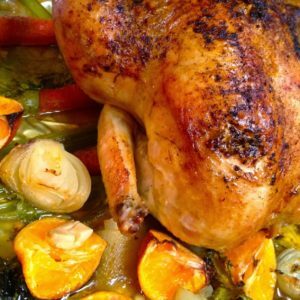 Crispy, seasoned skin covers a tender, juicy chicken that is beautifully flavored with lemons, garlic and onion. There are a few tricks to making it “perfect” and you’ll be amazed that it comes out that way every time you cook it. I cannot tell you the number of times I’ve made a roast chicken. 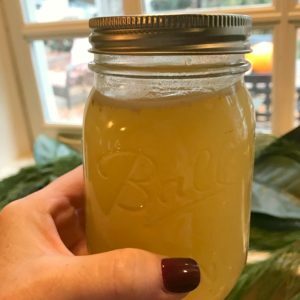 I’ve been doing it for years and have several different seasonal versions. There’s lots of reasons I like roasting a bird. It’s easy, it’s a one pan dish, feeds the whole family (most of the time) and it gives me something left over to make chicken stock with. 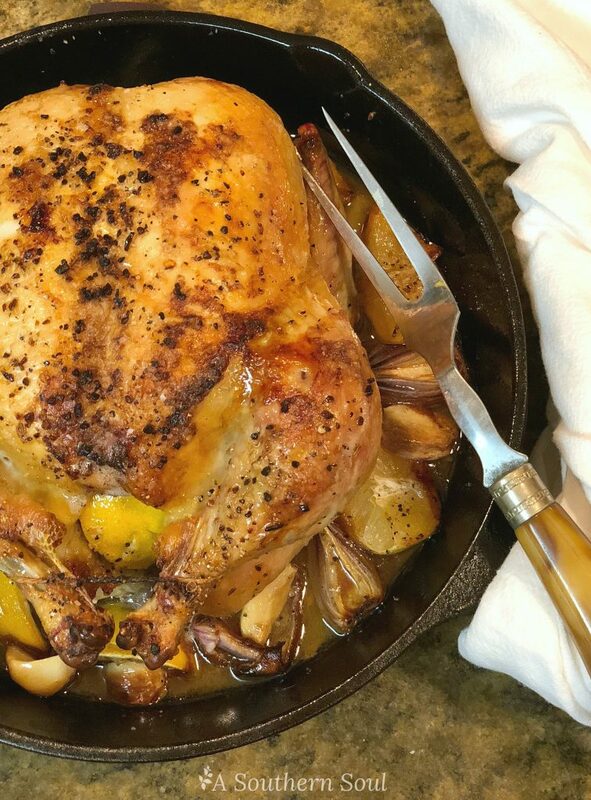 Over the years, I’ve tried many, and I mean many different ways to roast chicken. They include, cooking in a bag, placing it on a roasting rack, covering it and uncovering it. Some of these methods work better than others but I’ve discovered what I feel is a fool proof way to roast chicken and it turns out perfectly every single time. 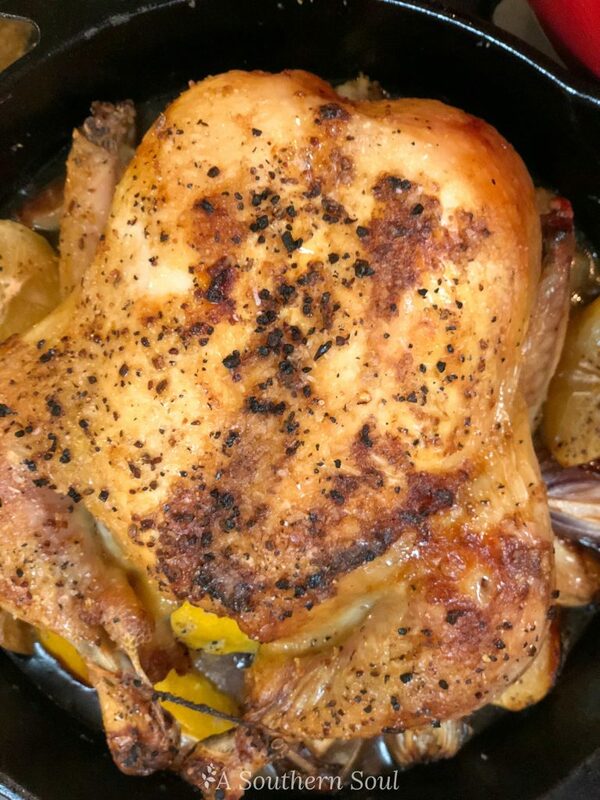 The first and maybe the most import step that you DO NOT want to skip if you want crispy skin is this – place your chicken, uncovered, in your skillet in the refrigerator for at least 1 hour prior to cooking. Yes, uncovered. This allows the chicken skin to dry out enough to make a huge difference when you roast it. Once the chicken has been in the fridge for an hour or so, remove it, place it on your counter for approximately 15 minutes so that it can “shake off the chill” before you are ready to place it in the oven. a well seasoned cast iron pan is naturally NON-STICK. 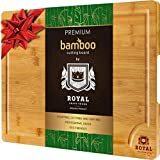 The more you use it, the more seasoned it becomes so that you can actually use less oil for healthier cooking. they are easy to clean. You never use any harsh chemicals or cleaners on your cast iron. Just wash with hot water, dry, then lightly coat it with vegetable oil so that you’ll be ready to use your pan for the next dish. they have a more even cooking temperature since they are heavy and hold their heat for longer than other pans. they are nearly indestructible and improve with age. I use a 10 inch pan when I roast a whole chicken and everything fits nicely in the pan. I use lots of seasoning and no extra liquid. 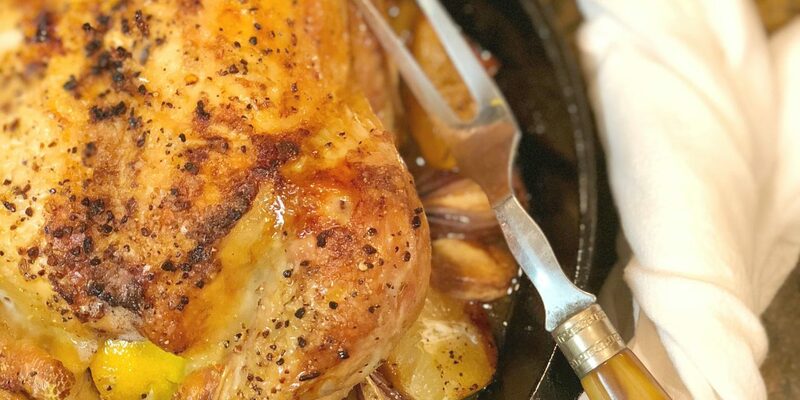 Using the cast iron skillet along with the aromatics and natural juice of the chicken produces just enough drippings to use if you want to add a little bit of something special to your dish when serving. So, there are you are! 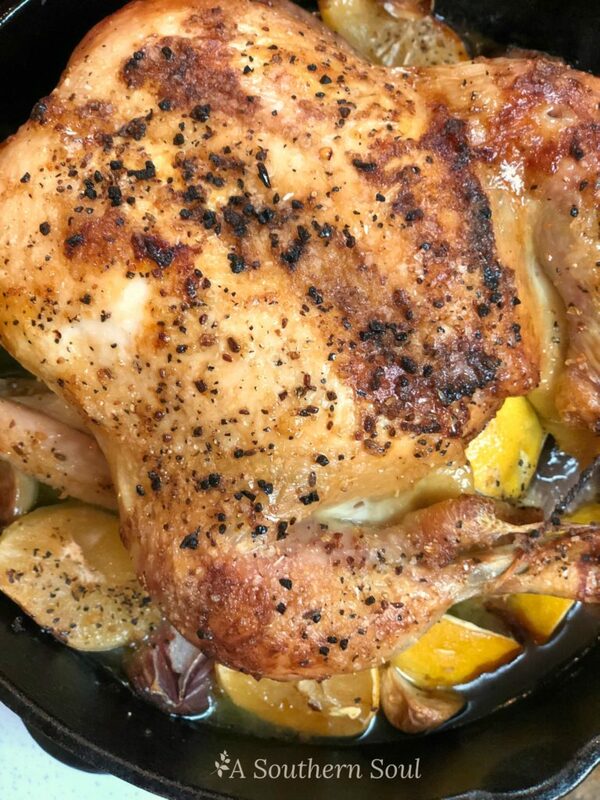 A few simple yet important steps to give you the best, perfectly roasted chicken…every single time. Tender, juicy chicken with crispy, seasoned skin that's perfectly roasted. 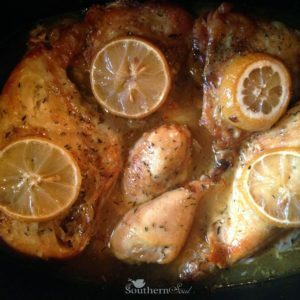 Flavored with lemons, onion and garlic then cooked in a cast iron skillet ~ this dish is always the star at any meal! 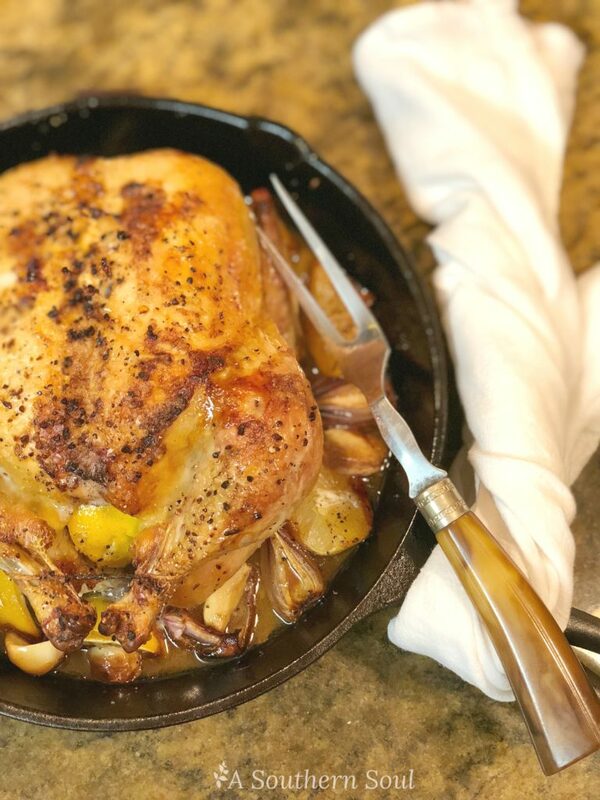 Remove chicken from packaging and place in cast iron skillet. Put skillet with chicken (UNCOVERED) in refrigerator for 1 hour. Take chicken from fridge and place on counter for 15 minutes. Place 2 lemon pieces along with 1 onion quarter in cavity of chicken. Scatter remaining onion, lemons and garlic around pan. Drizzle chicken, onion and lemons with olive oil. Sprinkle with seasoning. 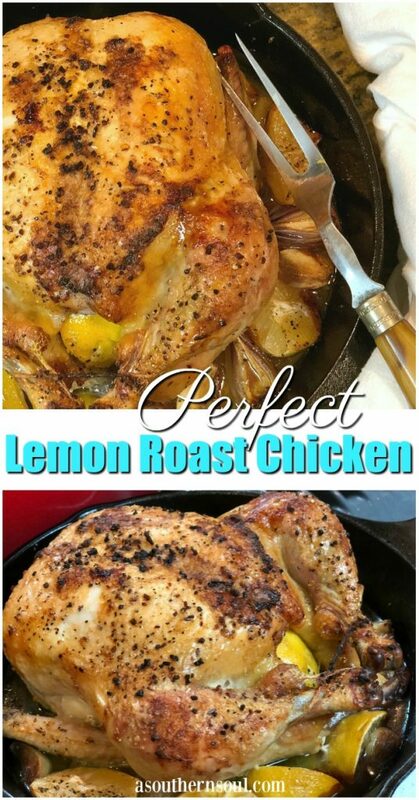 Slice chicken and serve with drippings along with onions and lemon. 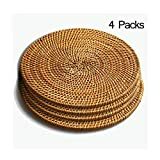 Rattan Trivets for Hot Dishes-Insulated Hot Pads,Durable Pot holder for Table,Coasters, Pots, Pans & Teapots,Natural Wooden Heat Resistant Mats for Kitchen,Set of 4,Round 7.08"
This looks so good. I love lemon and chicken. And, I love that it is made in a cast iron skillet. I love my skillet. I made this tonight strictly by the recipe, and all I can say is wow! Just wow! This is most definitely going in my keepers. THANK YOU, THANK YOU, Lora for letting me know about your success. I am just beaming that you loved the recipe. I hope you’ll keep coming back to A Southern Soul.